How Big is the Internet and How Much Bigger Can it Get? For most people, the internet is this huge expansive vacuum that contains so much information on it that their brains can’t even fathom how it could work. So, here we are to answer the question: how big is the internet actually – and how much bigger can it get, growing day by day? Just how big is the internet, you ask? According to Internet Live Stats, every second the following occurs: 6,000 tweets are sent; 40,000+ Google searches are made; 2 million emails are sent. In order to cope with the vast amount of usage, the internet has to be big. Plus, according to Live Science, with already over 1 billion websites online in 2014, and with new ones popping up as often as old ones revert to their Error 404s, the internet is in a state of constant flux, and it’s almost impossible to truly grasp its scale. But that’s just the parts of the internet that are registered to be counted in the searches – the Deep Web contains many anonymous, unlisted websites that would no doubt change the overall stats. In essence, the internet is almost impossible to quantify. Anand Rajaraman, founder of Kosmix, a source of internet information, states that the visible web is only a small aspect of the actual size of the web, with some figures placing it at just 0.03% of the size of the full internet. To answer our titular question in a tangible way is to add up the data held by the major databases (Microsoft, Google, Facebook, Amazon). Science Focus estimates that the four databases account for 1,200 petabytes of data – which equates to 1.2 million terabytes, where 1 terabyte is 1,000 gigabytes. 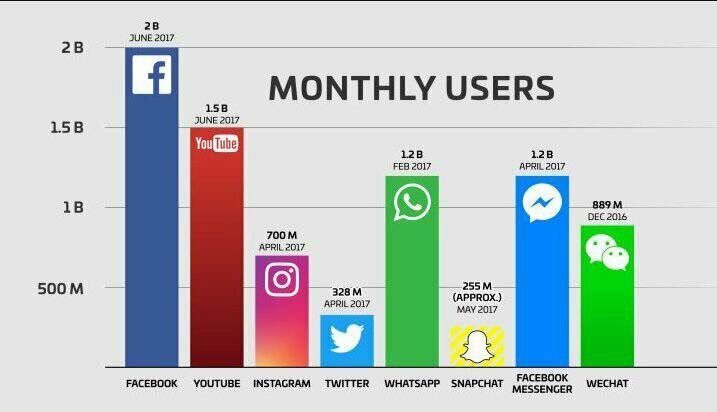 But, as Zephoria states, with the 1.94 billion Facebook users increasing at the rate of 18% per year, the amount of data contained in the database is growing. And with sites and data being exchanged online far faster than they are being erased, the internet is literally expanding every day. manmade creation of fibres exchanging information. The more fibres are made, the greater the size of the internet. Looking at data transmitted daily, figures show a slower rise in 2017 than in previous years. It was a rise of only 1%, according to The Next Web, but this 1% is a vast increase. This can be explained by not only the greater amount of people and sites interacting online, but also by the rise in internet speeds, advancements in countries where the internet was less accessible, the improvement of fiber optic data transmission, and the rise of the Internet of Things. We also need to take into account the nature of data being transmitted nowadays. Sharing has certainly become very visual, with apps and sites introducing greater methods for sharing images and videos, all of which take up more room than flat text. The way we interact with the internet has also boosted the amount of data an interaction will require. For example, it used to be the case that a text post on Facebook was just made up of words. In late December 2016, though, Facebook pushed an update which actively encourages users to automatically turn short word posts into images with colorful backgrounds, stickers and more. In the past year, we’ve also seen YouTube introduce live streaming and encouraging streams to be high-quality. What’s more, Area 120, Google’s “workshop for experimental products” has recently made Uptime available, an app which allows users to watch YouTube clips together – each from their phone – and react to them with stickers and text. But even smaller, more niche industries are affected here: for example, while playing a casino game online a few years ago meant that the provider’s server would have to let you load the game and then just transmit the results of the game, new technology in the form of live casino games mean that a player’s experience takes up much more data. Casino operators have been at the forefront of technology, with the introduction of live casino games available now online, operators like Betway Casino have evolved from traditional casino games, having a player choose to play live blackjack or live baccarat, for instance, over the non-live versions available (High Limit Baccarat, multi-hand blackjack etc) automatically means that a much bigger amount of data will be transmitted from the operator’s server to the player’s computer or mobile device. The actual amount of data live streaming uses in any context is not easy to define, as it depends on the video format and analysis, but NBN points out that streaming films on Netflix on standard definition means 0.7 gigabytes per hour per user, while Ultra HD is 7 GB per hour. It’s no wonder, then, that the more we opt for using the internet for video and live video, the more data is buzzing around on the internet. A Reversal on Data Usage? But not all apps or websites are what they seem when it comes to the amount of data they use. One would expect that AR (augmented reality) gaming like Pokémon Go, and the Snapchat Maps feature are also a drain on the data needed. Location services are constantly on and interacting with the environment. However, a Business Insider report found that Pokémon Go used significantly less data than Facebook does with their intense visual transmissions in the same period – with only 3 megabytes per hour being used, compared to 90 megabytes per hour for the same usage on Facebook. The way in which the game works requires less data to be transmitted, and therefore uses less data to play it. Given that the world is moving more towards these AR games, could this mean that our data use will go down? We’ll just have to wait and see, although our guess is no. The demand for the internet is vast and it is very unlikely that our data consumption and transmission will go anywhere but up. More and more businesses are leaning on internet-heavy functionalities, and there is a big press to try to move everything online. From cloud storage to entire businesses that exist only in the online sphere, we are a data consumption machine, and the internet will just have to make room for us. So check which ISP is considered great this year and experience a fast and relieable connection.